The new Renault Mégane Coupé-Cabriolet rounds off the renewal of the new Mégane range in style with the introduction of the line-up's sixth body type. The newcomer's striking looks combine the elegance of a coupé with the promise of the thrills that go hand-in-hand with driving a cabriolet. · a broad choice of engines, including one which can be ordered with the all-new automatic EDC (Efficient Dual Clutch) transmission. · careful attention to quality, including high-gloss black and satin-effect chrome exterior features. New Mégane Coupé-Cabriolet is manufactured alongside Scénic and Grand Scénic at Renault's Douai plant in France. It consequently benefits from the experience gained since the beginning of the Mégane programme, including the assembly of the former-generation Mégane Coupé-Cabriolet. 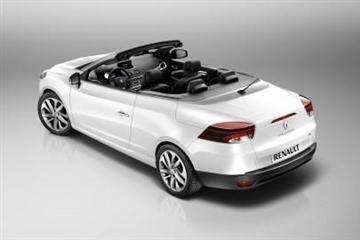 New Renault Megane Coupe-Cabriolet is an open invitation to enjoy an alternative way to go motoring, and is an elegant illustration of Renault's new brand signature, 'Drive the Change'. New Mégane Coupé-Cabriolet goes on sale throughout Europe in mid-2010. An Australian release is expected much later. New Mégane Coupé-Cabriolet completes the renewal of the New Mégane family in style with a car whose intrinsic appeal is sure to turn heads. Its looks exude a distinguished elegance that is underpinned by the large glass roof which tells you that this is unmistakably a cabriolet, even in its coupé configuration. This high-gloss finish black glass roof contrasts with the satin-effect chrome windscreen frame, while the sweep of the 'waistline' adds an unmistakably high-end feel that more than does justice to its cabriolet 'persona'. The dark red taillights feature a linear lighting pattern and LED brake lights to provide a distinctive rear lighting 'signature'. 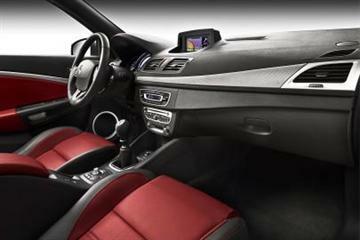 The interior lay out carries over the same prevailing elegance and refinement, thanks not only to the quality of the materials employed and to the high standard of finish, but also to the three choices of trim, which range from dark charcoal and light beige to the charcoal and red two-tone finish with leather seats. Although the floating dashboard is identical to that of New Mégane Hatchback, the seats offer additional lateral support, while the 'butterfly wing' door trim panel is specific to New Mégane Coupé-Cabriolet and adds to the newcomer's inherent elegance. New Mégane Coupé-Cabriolet's occupants benefit from the thrills of unruffled open-top motoring in all conditions. The standard folding glass hard roof boasts a transparent glazed area of 0.47 sq. metres (a segment best) to ensure a brightly lit cabin and a sensation of space and freedom. It also guarantees outstanding acoustic and thermal comfort, as well as the reassurance of greater protection from vandalism. The fully-automatic, electro-hydraulic opening mechanism of the two-part roof enables the driver to lower the top in just 21 seconds at the press of a button. 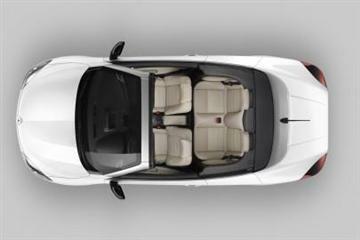 With the top down, the driver and passengers alike enjoy a real sense of freedom. Entry and exit is made easier by the more forward position of the windscreen header-rail which has been advanced by 6cm compared with Mégane II Coupé-Cabriolet. To make sure that all occupants are able to benefit from the pleasure of riding 'al fresco' without the drawbacks, new Mégane Coupé-Cabriolet is equipped with a fixed glass wind deflector (unique in the segment) positioned behind the back seat head restraints. This arrangement enables four people to enjoy draft-free driving at speeds of up to 90 km/h and, when used in conjunction with the removable mesh deflector screen located behind the front seats, allows two occupants to travel free from buffeting whatever the speed. New Mégane Coupé-Cabriolet's length of 4,485 mm ensures that the driver and the three passengers benefit from a standard of comfort expected of a family car. - reach and height-adjustable steering wheel (through 45 mm and five degrees respectively). - easy to access, with a segment-best sill height (590 mm from the ground) and aperture (258 mm) with the roof down, enabling three 'cabin' cases to be carried side by side. · customised settings and activation/deactivation of certain functions (daytime running lights, volume of audible parking proximity warning). - The MacPherson-type front suspension is attached to a so-called 'horned' subframe, an arrangement that ensures a level of lateral rigidity that is three-times superior to that of the former-generation Megan Coupé-Cabriolet. - The rear suspension's torsion beam features a lighter, closed-profile beam that delivers enhanced torsional stiffness. - The new electric power steering system is more responsive and refined, and gives even more accurate feedback of information from the road. The torsional rigidity of the body shell has been uprated by 80 per cent compared with Mégane II Coupé-Cabriolet in order to match the increased stiffness of the suspension and for even greater handling precision, whether the roof is up or down. New Mégane Coupé-Cabriolet is available with a choice of seven efficient and eco-friendly petrol and diesel powertrain configurations. - The 1.6 16V 110 hp engine matched to a six-speed manual gearbox. - The TCe 130 (Turbo Control efficiency) driving through a six-speed manual gearbox. - The 2.0 16V 140 hp engine available with the new continuously variable transmission (CVT) for even greater driving comfort thanks to smooth, step-less gearshifts. - The dCi 110 DPF, matched either to the brand new six-speed EDC (Efficient Dual Clutch) dual-clutch automatic transmission (see below) or to a manual six speed gearbox. - The dCi 130 DPF which drives through a six speed manual gearbox. - The dCi 160 DPF also with a six speed manual gearbox. The six-speed EDC (Efficient Dual Clutch) dual-clutch automatic transmission fits perfectly with Renault's bid to combine ride comfort, driving pleasure and respect for the environment. - instant response to the driver's demands. · cruise control with speed limiter. · ESC with understeer control. · Isofix child seat anchorage for rear seats. 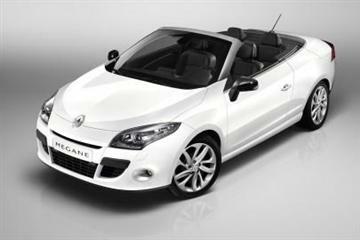 The public will get its first chance to see the new Renault Megane Coupe-Cabriolet when it is unveiled at the forthcoming Geneva Motor Show (4th-14th March, 2010). It will also be displayed at L’Atelier Renault on the Champs-Elysées (N°53) in Paris, France.